Field Guide to the Birds of Utah | Tim Avery Birding.com: Bird Photography and Identification, Utah Birds and Birding! It's still in the works so stay tuned! The state of Utah has had nearly 475 species of birds reported within its borders. There is currently no place where this information is in a cohesive package with details about the most common to the rarest species. Hopefully, when completed, a Field Guide to the Birds of Utah will fill that niche. 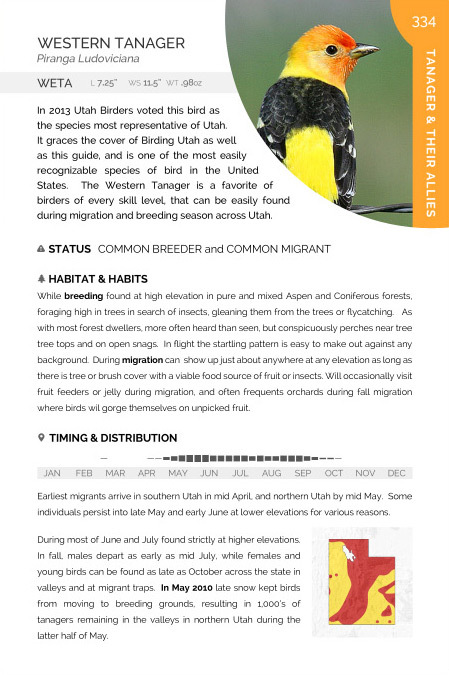 In 2010 I started work on a Field Guide to the Birds of Utah. For the past four years I have worked on species accounts on and off when time permitted. I have worked on page layouts, some maps, and abundance charts as well. Although a good portion of the work has been completed it is an uphill battle that I had hoped to finish some time ago. I will continue to work on the project till it is eventually complete but I don't have a firm date set in stone. With over 450 species having been seen in Utah and wanting a complete as possible work I know there will be a digital and print version of the book, with the digital being kept further up to date than the print with every new sighting, and change happening in real time. Included here is a sample plate. This is the 2nd version of the plate I have come up with, and there will likely be more changes when I get to the final version. This is not meant to be a full fledged field guide for identification purposes but more of a field guide supplement with information specific to Utah that related to the species. Photos will not show entire birds, or necessarily the most representative version of the species, but will instead be enticing for the viewers. Although some amount of identification can be done with this guide, it will be more useful as a life history, distribution, timing, and supplement. You can click on the image to view at a larger size on mobile and tablet devices.